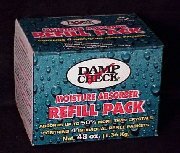 SUPER ABSORBENT FORMULA: DAMP CHECK's super dry pellets absorb up to 50% more moisture than products using flake or mini-pellet formulas. Refill box contains four (4) individual 12 oz. refill packets.